Ones, tens, hundreds, and more... counting place value is a lot easier when there are cookies, flowers, and friendly animals involved. Help your first grader practise counting place value with our year two place value worksheets. Find other helpful Year two worksheetsOn Education.com. 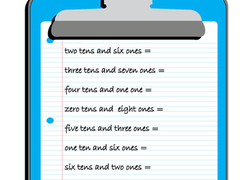 Boost your first grader's number sense with a lesson in place value up to the tens place. Help your students use their knowledge of place value to add or subtract 10. By understanding how numbers are made of tens and ones, students learn how to add and subtract 10 with ease. Here's a counting challenge fit for your little maths whiz. practise counting past 100, all the way up to 150! This worksheet is an easy introduction to the number 100. Help your child compare and contrast large quantities, and get her thinking about weight and volume. Is your kid confused by counting? Counting on a hundreds chart, to the rescue! This pair of place value worksheets helps kids sharpen their addition skills by giving them a little visual help. 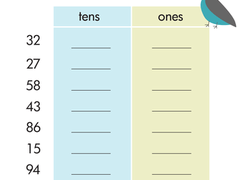 Help your child improve his maths skills determining place value with this printable, which is all about the ones and the tens place. challenge is maths skills. Engage your students in learning about place value by having them make their very own numbers! 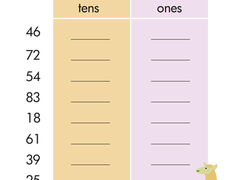 Students will have fun drawing out tens and ones to create any number they wish with this creative maths worksheet. What do the numbers 11 through 19 have in common? This maths and patterns worksheet features a number chart to help your kid learn how to recognise patterns. 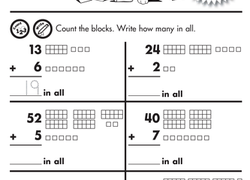 Take a look at how numbers are formed with this place value worksheet. Dive deep into word problems with this helpful practise worksheet that requires students to sketch a solution using sticks and circles to represent base ten blocks. Build fluency by identifying one more and ten more than a given number within 100 with this worksheet! Place value is a tricky concept. Help your first grader understand it better with these worksheets! Take the concepts off the page and use unit blocks to let your child visualize the values.